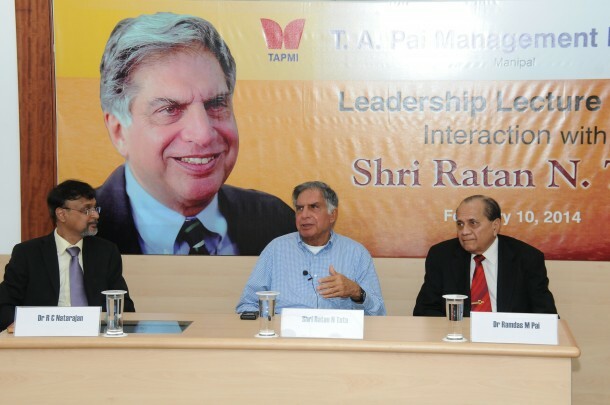 Mr Ratan N. Tata, Chairman Emeritus, TATA Group of companies interacted with students of TAPMI, Manipal on diverse topics. He showed a lot of optimism in the future business scenario in the country and emphasized the need for strong leadership, both in business and in political spectrum. When asked about the brain drain from India, Mr. Tata reflected that if adequate facilities and opportunities are made available in our country, we can go a long way in tackling the issue. When quizzed on the decision to withdraw from the banking sector, Mr Tata explained to the students that the conditions put forth by the regulators to operate in the banking sector created a conflict with the existing way of functioning of the TATA Group. Mr Tata proudly explained the strong cultural values that Tata group is known for, stressing the importance of serving the society with responsibility. Thus, he was sceptical about the law that mandates companies to undertake CSR activities and believes that CSR should come naturally to all corporates rather than by a mandate from the State. Mr Tata also shared the influence Mr J R D Tata had on him, which moulded him to the leader he is today. The three major aspects JRD Tata taught him were to be low key, to be driven by values and not be motivated by personal greed. When a student debated on the lack of adequate encouragement for women entrepreneurs in India as compared to the Western countries, he disagreed saying that women’s position in India is equally good as elsewhere and specifically cited the example of the country having had a woman Prime Minister. He also exuberated optimism stating that bureaucracy in India is not something that one should to be discouraged by but one should learn to tackle effectively. 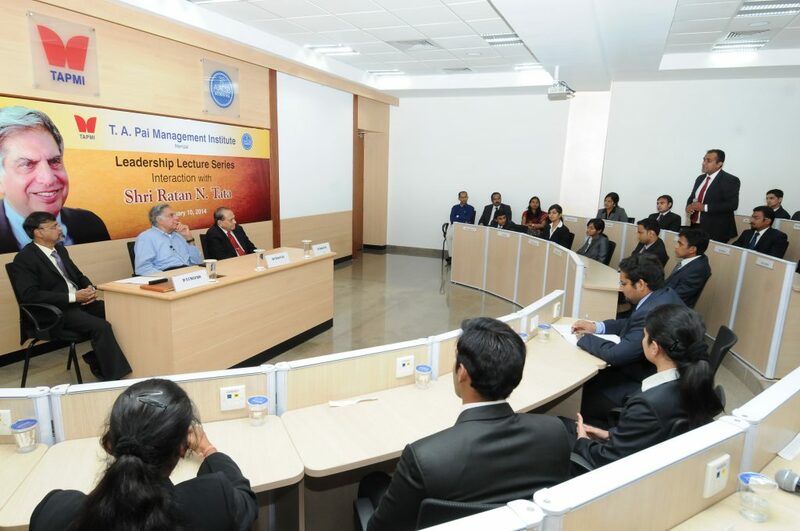 His specific advice to the budding managers was to aspire to make a difference in the world rather than strive just for personal advancement and glorification. This, in his opinion, is the key to becoming a successful manager. The T A Pai Management Institute (TAPMI) located in the international university town of Manipal (Karnataka), is among the leading management institutes in India, and is reputed for its academic rigour and faculty-student interaction. Founded by the visionary, Late Shri. T. A. Pai, TAPMI’s mission is to provide much needed impetus to the task of building professional management capability in the country. In the process, it has also played a role in strengthening the existing educational and health infrastructure of Manipal.